While Joe Satriani's dizzying six-string wizardry certainly has been well-illustrated on his studio records, the shredding takes on an altogether more monumental scope when it incites the roar of a big crowd. 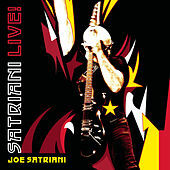 Compared to his debut live effort recorded in San Francisco, Satriani Live is bossier and brassier, kicking down the door on Satch classics like "Flying in a Blue Dream" and "Scratch Boogie" with his typically mercurial deftness. The two-disc collection also offers screaming versions of more recent material like "Made of Tears" and "Super Colossal."